I'm joining Susan at Between Naps on the Porch for Tablescape Thursday. Be sure to visit and see other lovely table settings like the one my friend set below. 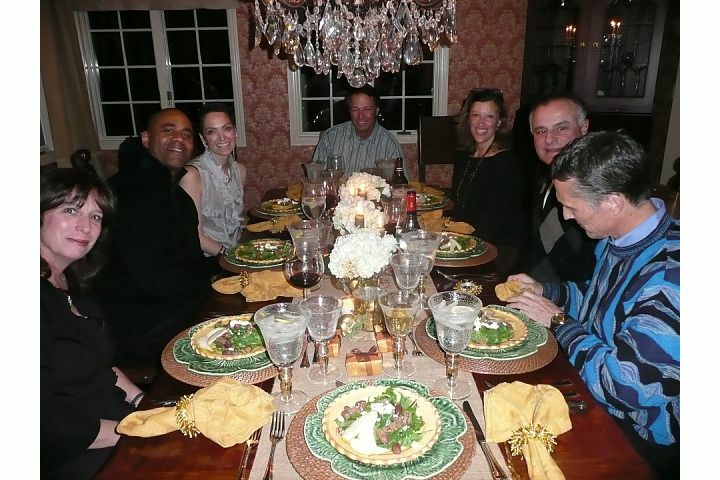 The 4th Gourmet Dinner party was held in December and hosted by Bob and Heather. 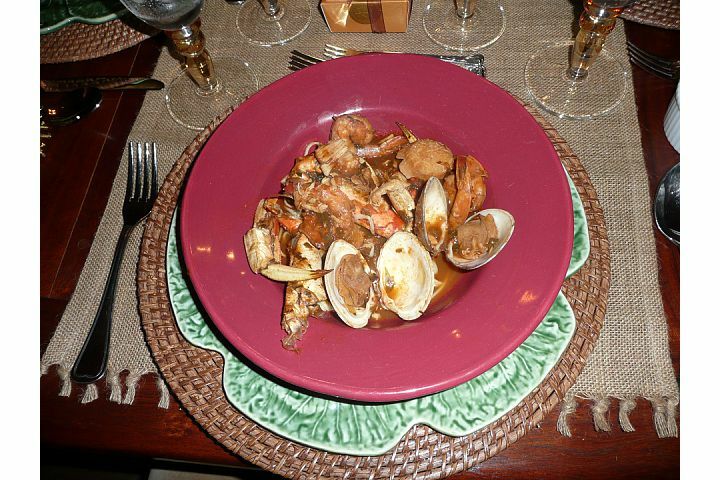 The "planning committee" met a month earlier and decided on Cioppino for the main course. When we arrived, I had to stop and admire the table. I love how Heather used white hydrangeas as centerpiece flowers, along with beautiful candles everywhere. Table runner, chargers and glassware by Pottery Barn. The hostess, Heather! I helped her decorate her dining room several years ago, choosing the terracotta damask wallpaper and captain's chairs. Her sister-in-law, Leslie Sinclair from Segretto in Houston helped her with the window coverings and new monogrammed captain's chairs most recently. The Planning Committee, Jenny, Delores, Tye and Heather. 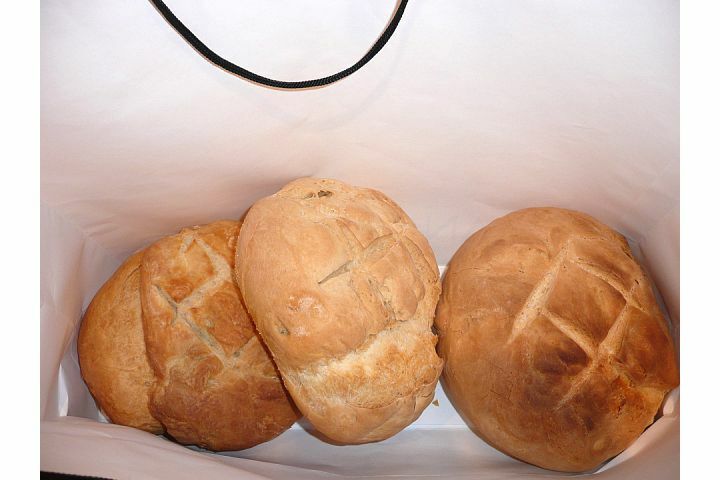 The Sourdough Bread. Tye actually made his own sourdough starter three weeks earlier. It was delicious dipped in the Cioppino! Tye made both a crab and a halibut remoulade to be served with pita bread. Tye also made this caramelized brie cheese ring with pecans. Jenny made this pear salad with roasted grapes, gorgonzola and candied pecans. Heather made the Cioppino. It was the perfect main course for this time of year. The Gourmet Club sits down to eat. "Blue Bottle Coffee" espresso ice cream, on the right is maple syrup ice cream. Before we said good-bye, we decided to have another dinner in January which would include our kids before they went back to school. More on that to follow at a later date. I'm also joining the potluck party at "Foodie Friday" hosted by Designs by Gollum. Be sure to visit and check out what everyone brought to the party. What could be better than ripe runny Brie? How about ripe runny Brie with a topping of chewy caramel and crisp spiced nuts? Be careful if you serve this as an hors d’ oeuvre – your guests might not save room for dinner! 1. Combine the brown sugar and water in a heavy-bottomed saucepan and bring to a boil. Cook over medium heat until the mixture reaches the soft ball stage (240o on a candy thermometer), about 4 minutes from the time the mixture begins to boil. 2. Let the mixture cool slightly, and then stir in the cream. Continue to boil for another 3-4 minutes until the mixture is glossy and slightly thickened. Remove from the heat and stir in the butter. Fold in the spiced pecans. 3. Pour the caramel evenly over the top of the cheese so it coats the top surface and runs a little over the sides, distributing the pecans with the help of a knife or spoon. Serve with slices of French bread, crackers or apple wedges. The unusual combination of sweet and spicy makes these crunchy nuts irresistible. 1. Preheat the oven to 300F. Melt the butter in a large skillet. Add the sugar and spices, remove from the heat and stir to dissolve. Let cool, and then stir in the egg white. Pour the mixture over the pecans in a large bowl, then stir and toss until they are evenly coated. 2. Transfer the pecans to a baking sheet and spread them in a single layer. Toast in the preheated oven, shaking and tossing 2-3 times during cooking, until the pecans are golden brown, about 20 minutes altogether. Transfer the nuts to a bowl or tray. When the pecans are cool enough to handle, rub them between your hands to evenly distribute the sugar coating and avoid clumping. Cool completely. Serve as a snack or with cocktails. Whisk first 3 ingredients in medium bowl to blend. Stir in crabmeat or halibut, celery, 3 tablespoons chopped chives, and lemon juice. Season with pepper. DO AHEAD: Can be made 6 hours ahead. Cover and chill. Place a lightly oiled bowl, turning to coat. Cover with plastic wrap and let dough rise in a warm, draft-free place until doubled in size, 1 to 1 1/2 hours. Turn out onto a lightly floured surface. Sprinkle lightly with flour and knead gently, removing any large air bubbles. Knead into a small circle, then shape into a tight ball, pinching the seams together underneath. Place on a well-floured board or baking peel, seam-side down. Cover with a kitchen towels and let rest until doubled in size, about 1 hour. The table looks beautiful and the food looks like it is tooo good. Thanks for sharing the recipes. Oh my goodness, Delores...thanks for all those great sounding recipes! I'm copying each one for future reference. Hi Delores, what a FEAST! Everything looks so delicious (especially dessert.) :D Great combination of flavors. Thank you so much for your sweet comment on my blog ~ I'm so happy to "meet" you. I'm originally from Palo Alto, so we were practically neighbors. Small world sometimes! It all looked so good but I don't eat shellfish. I would have been fine with the salad, the brie and some of that beautiful sourdough bread. And of course some of that wine. Everyone looks as if they had a wonderful time. How could they not with such yummy delights awaiting. I didn't mention that the cioppino was made with and without shellfish because one of our members does not eat shellfish. Hence the halibut remoulade as well. Looks like a fabolous dinner party! Just beautiful! Thank you for sharing. I am always espescially interested in the menus and any seafood diah will win my heart! Delicious! The idea of a gourmet club sounds really fun! I'm all for eating dessert first, and that homemade ice cream looks delectable! Beautiful table, and a great idea to get together with good friends and share really great food! Beautiful table and the food looks delicious. Oh my a beautiful table, food and people! Love it! Thanks for all the recipes too!! Looks like a fun party! Pretty table as well! This is a lavish and wonderful post! What a glorious evening this must have been. And thank you for the wonderful recipes. I could have a great dinner party using just this post! Lovely table and people and wow the food is making me so hungry! It looks so pretty & inviting here. So cozy too. TY for sharing your fab ideas & the recipes. For me this meme is heavenly fabulous as I love having a beautiful home. Sorry for my poor tablescaping as of now. It's my first time to join Tablescaping. I will be attentive next time. Such a gorgeous tablescape! You did a terrific job helping her decorate the dining room, too. The food looks yummy! What a wonderful feast. You've shown us a beautiful table and gorgeous food. I'm most appreciative of the recipes you included to share with us. This must have been a fantastic evening. Have a wonderful Foodie Friday. I wish I could've been there! Oh, the food,flowers, candlelight, and dishes. Heaven! Your table is lovely and the food looks delicious! Thank you for posting the recipies too. Oh my gracious goodness. I wanted to dive right into that cheesecake...thank goodness my monitor kept me away from all those calories. Thanks for sharing...it is simply lovely!